191 new inserts in cBN grade BC8120. Longer tool life with PVD coating, when turning hardened steels. Coated with a new TiAlSiN technology for excellent welding resistance. The Ultra Micro-particle Binder in the substrate disperses cutting forces radially designed to help prevent sudden fracture. 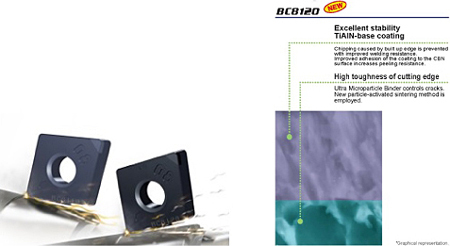 BC8120 for extended tool life in more severe hardened steel applications. Whereas, BC8110 is ideal for long tool life in continuous hardened steel applications. cBN inserts in a variety of hones to maximize efficiency and tool life performance.